Skin disorders are nearly universal in residents of Western countries: Between 79 and 95 percent of American adolescents have acne, and 12 percent of women and 3 percent of men struggle with it into middle age. Rosacea, eczema, psoriasis, and dermatitis are also common. For a long time, dermatologists believed skin health had little to do with diet. Then researchers discovered nearly acne-free societies, including the Kitavan Islanders of Papua New Guinea, the Aché hunter-gatherers of Paraguay, and the Inuit prior to the 1950s. These cultures’ diets shared key characteristics: They consisted of minimally processed foods and were low in sugar. Moreover, the Canadian Inuit started showing signs of acne in the 1950s when they added processed food and sugar to their diets. A new paradigm has emerged: Healthy skin equals a healthy start in the kitchen. 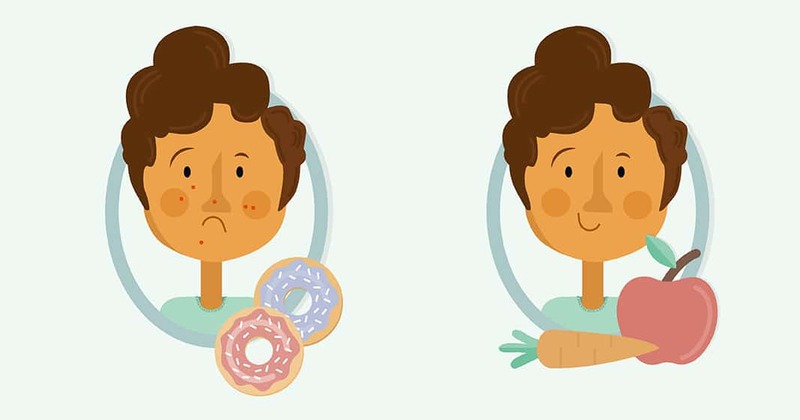 A number of studies support a connection between diet and skin health, and the American Association of Dermatology concurs that diet can play a role in acne. If you struggle with a skin problem, it can’t hurt to include more nutritious foods in your diet. Keep reading to learn about some surprising and not so surprising foods your skin may be craving. Liver, anyone? In an Italian observational study, women who ate fruit, vegetables, and fish four or more times a week were less likely to have acne than those who did not. That may be because plant foods contain a complex mix of nutrients and antioxidants that nourish and protect skin cells. The antioxidants beta-carotene and lycopene are especially important for maintaining healthy skin. Receptors in the skin turn beta-carotene into vitamin A, which is critical for skin health. To up your beta-carotene intake, reach for dark-green leafy vegetables, and yellow and orange fruits and veggies, such as winter squash, cantaloupe, apricots, sweet potatoes, carrots, pumpkins, peaches, and mangoes. Lycopene helps protect the skin from UV radiation. Sundried tomatoes, cooked tomatoes, and watermelon are good sources. Both nutrients are fat soluble, meaning eating them with oil will help your body with absorption. In the Italian study cited above, fish consumption was also linked to skin health. Fish contain omega-3 and omega-6 essential fatty acids, which reduce inflammation in the body. Fish and seafood also contain zinc, vitamin D, selenium, and other important nutrients for skin health. Look for fatty fish that are low mercury, such as salmon, anchovies, and sardines. People with skin disorders have a higher risk of suffering from mental health and gastrointestinal disorders. Some researchers theorize these disorders stem from an imbalance in the body’s microflora (the vast ecosystem of tiny organisms in our guts and on our skin). Eating foods that contain live beneficial bacteria (probiotics), such as miso, tempeh, kimchi, yogurt, sauerkraut, lacto-fermented pickles, and kefir, may decrease inflammation and improve skin conditions. In a Korean study, subjects who drank kefir had less oily skin and a significant reduction in acne lesions compared to a control group. Sauerkraut and kimchi may provide additional benefits because they’re high in sulfur, a mineral that plays a critical role in maintaining healthy skin. Integrative physician Tierona Low Dog, author of Healthy at Home, prescribes pre-meal bitters to treat eczema and other skin conditions. The bitter taste stimulates the production of stomach acid and enzymes, which may improve digestion and help the body absorb more nutrients. Moreover, bitter foods tend to be packed with nutrients because phytonutrients have a bitter taste. Not keen on the bitter taste? Gradually add more bitter foods, such as green tea, kale, wild greens, and broccoli, to your diet. Organ meats were a staple in most traditional diets, and they’re still popular in Scandinavia, Europe, and other regions. Liver contains large amounts of vitamins A, B12, and B2 as well as iron, zinc, folate, coenzyme q10, and other important nutrients for skin health. In fact it is so rich in nutrients that some experts recommend only eating two servings a week to prevent overdosing on vitamin A. If organ meats don’t sound appetizing, try a liver pate or mousse, or get these nutrients from other sources. The path to healthy skin can be delicious. Begin transitioning to a nutrient-dense, minimally processed diet, and you’ll likely see improvements in your skin and overall health. Abby Quillen writes about sustainability, green living, health, business, and other topics. Her work has appeared in The Christian Science Monitor, YES! Magazine, and dozens of other publications. She lives in Eugene, Oregon with her family. Visit her at abbyquillen.com.